Sequel to Xevious. The gameplay is very much like the original Xevious except this time it is a little more difficult. Several new enemies were introduced in this game, including a silver Galaxian flagship, a rare silver Galaga scorpion ship, two jet planes, a helicopter and a dark yellow Tank Battalion tank. The hidden towers (AKA "Sol Citadels") were also located in different places. The four special flags are also in different places. 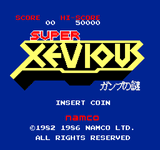 Source: Wikipedia, "Super Xevious", available under the CC-BY-SA License.